Presents a thoughtful and disturbing critique of Western culture obsessed by the "culture of economism," in which economic causes or factors become the main source of cultural meanings and values, thus perpetrating inequality, injustice, and divisions. - Publisher The authors see the West as obsessed by the "culture of economism, " a pervasive and often oppressive culture in which economic causes or factors become the main source of cultural meanings and values. They acknowledge that the culture of economism manifests itself also in the organizational culture of the church. But on the positive side they see recent paradigm shifts at the organizational level in both the church and economism that present a window of opportunity for mission. 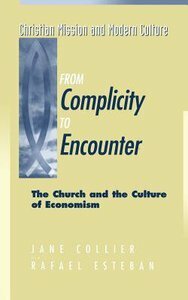 Collier and Esteban believe that mission within and to the "culture of economism" needs to be a mission of encounter in which each challenges the other to conversion. Such conversion does not necessarily imply the abandonment of power but of its misuses together with a commitment to the pursuit of the good. About "From Complicity to Encounter"
The authors see the West as obsessed by the "culture of economism, " a pervasive and often oppressive culture in which economic causes or factors become the main source of cultural meanings and values. They acknowledge that the culture of economism manifests itself also in the organizational culture of the church. But on the positive side they see recent paradigm shifts at the organizational level in both the church and economism that present a window of opportunity for mission. Collier and Esteban believe that mission within and to the "culture of economism" needs to be a mission of encounter in which each challenges the other to conversion. Such conversion does not necessarily imply the abandonment of power but of its misuses together with a commitment to the pursuit of the good.